It is now recognised as a major Pacific wide event that has effects that spreads right round the World. They affect New Zealand's weather over a time-scale of five to twelve years and bring recognisable changes to the weather pattern. Classic El Nino - La Nina. The system is a repeating pattern which can be described as starting in a Neutral phase with a low pressure system over Indonesia and a steady trade wind going west from Ecuador towards Indonesia (See the map at the top). 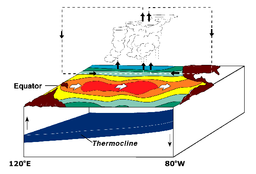 With that situation there is a modest build up of warmer water in the Indonesian region. The next stage could be La Nina or negative stage where the warmer water makes a bigger low pressure system over Indonesia. This increases the strength of trade winds which causes a build up of more warm water around Indonesia. The steady stream of water across the Pacific driven by the trade winds causes an up welling of cooler water off the South American coast bringing up cool water and nutrients and to feed fish and give good fishing. This sea temperature map from Wundermap shows how the trade winds which blow from Ecuador across the Pacific, draw cooler water from the deep. This cool water is represented on the map by the yellow strip down the Chilean coast and out across the Pacific at the equator. This will concentrate warm water in the Indonesian region. 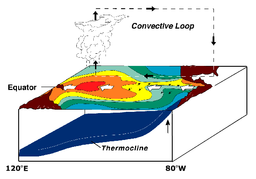 This triple illustration from NOAA shows how the cooler deep water is draw to the surface (middle illustration) and a cloud of warm moist air over Indonesia. 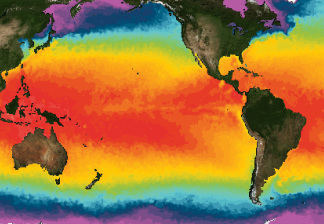 El Nino or positive stage. 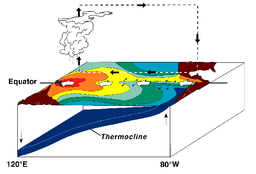 There would be a brief neutral or change over period before the onset of an El Nino or positive event. In this the trade winds fail and the warm water from the West Pacific floods back towards the South American coast, the high pressure switches to Indonesia and the low pressure moves to the Eastern side over Tahiti. The warm water is now on the Ecuadorian coast with low pressure and moisture spreading rain to that side of the Pacific and beyond to effect Africa and North America. The change in the Pacific pressure system would tend to bring warm moist air to North East New Zealand and a tendency to drought in Otago. The high pressure over the east Pacific brings drought to Northland and the constant West wind on the South Island would again bring a tendency for drought in Otago. Rainfall difference for New Zealand. The two maps below from MAF show the difference in mm of rainfall from the average. The two maps are for rainfall in the summer months when drought is most critical and give an indication of the increased risk with each type of event. More detailed analysis from NIWA. Although these events make up only 25% of our weather there effect is sufficiently different and predictable to make it worth planning for. El Nino event. Starting in Summer quarter. La Nina event. Starting in Summer quarter. In broad terms it is drier in an El Nino event and wetter in La Nina. Go to the NIWA website for up to date information.